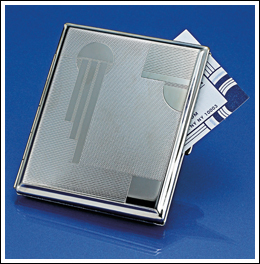 Meticulously manufactured from the original die stamps used in the 1930’s, each German Silver (nickel) case is hand-assembled and then given a protective clear lacquer coating to preserve the all-silver finish. Bob uses his to hold our Things Deco business cards. Also holds credit cards or cigarettes. Case measures 3” X 3-1/2".